You might want to come on a singing workshop for the first time, but have questions. Here are some that come up regularly. Q. Do I have to have a ‘good’ enough voice to come on a singing workshop? A. All voices are welcome. All you need is to love singing. You might be a bathroom warbler or quite a regular singer with a choir or group. 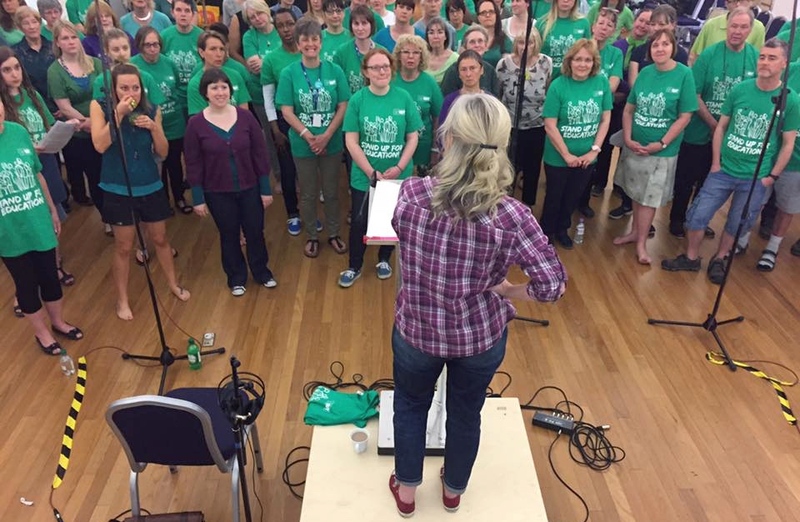 The great thing about community singing is that singing together we can have a real mixture of voices. As long as you are prepared to give it a go, listen well, remember you are singing in a group, not on your own, you are welcome. Most workshops see a mixture of singers, from beginners, returning singers, who may have not sung since they were at school to experienced singers who are regular workshop goers and may be in regular choirs and singing groups. Q. If I come to a singing workshop what might I expect to do? A. The day will start with a group vocal warm up. This includes everyone sitting or standing in a circle doing some simple shaking and gentle stretches. Then we do some simple ‘call and response’ patterns where Gitika sings some simple patterns and everyone copies them back. This gives everyone a chance to limber up their voices in a fun way -here is a shortened example of some of the things we might do to start the day. Q. What does learning by ear mean? A. No one needs to be able to read music to join in. The words of the songs will be projected on a wall and the songs will be learned bit by bit by listening and singing back. Here is an example of how a simple song might be taught. Q. How does the harmony work? A. Some of the of the songs in the day will be rounds and some will be sung four part harmony with different parts depending how high or low your voice is. The day will be “Acapella ‘ which means there will be no piano or guitar or backing tracks…just voices. Here is an example of a four part African song we might sing. This might take about half an hour to learn on a singing day. Q. What do you mean by “Lunch to Share”? or buy something like a set of cheese and crackers, dips and tortillas, bread, fruit. We will supply plates and cutlery. There will also be tea, coffee and herbal tea available for the breaks. Q. What other sorts of songs might we learn in a day? A. During one day we might learn 2 or 3 substantial songs and 2 or 3 simpler songs. At the end of the day we would sing them all again. Many of the songs are arranged by Gitika, and come from popular, world and folk traditions.